Doing your homework and playing games are all part of being a kid while you’re growing up, but many of us don’t understand just how much of an advantage we have in doing those things simply by being born with limbs.Tiyo Satrio is an 11-year-old boy from Penawangan, Indonesia who was born without that advantage most of us don’t even think about and has to think up many creative ways to perform the most trivial of tasks. 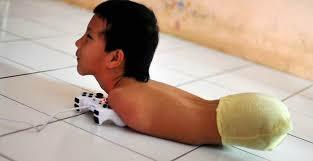 In order to write he grabs his pencil with his mouth and still manages to have neater handwriting than you’d see in most doctors offices, and to play games on his Xbox by partially laying down on the controller!Just because he was born with this disability he doesn’t allow it to define who he is, and with him only being 11 that’s an incredible outlook to have. Even in school his upbeat, happy nature has made him a class favorite amongst students and teachers alike!